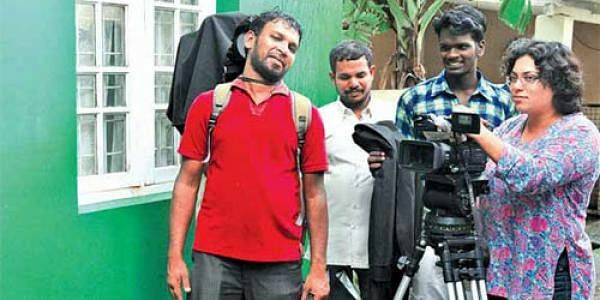 Fowzia Fathima entered the uncharted territory of the technical side of moviemaking and is playing her role with ease. She entered the uncharted territory of the technical side of moviemaking and is now playing her role with ease. For critically acclaimed cinematographer Fowzia Fathima, her career was not a pre-planned one. In the city for the shooting of comedy movie ‘Gulumaal’, Fowzia says she is enjoying every moment of her career. After doing Bollywood, Tollywood and Hollywood movies, she is now working on her maiden Malayalam project. “It’s an out-and-out comedy movie,” says Fowzia. A focused, confident and determined person with a penchant for perfection, Fowzia says she never had any difficulty gaining the confidence of men. “Even as a child I believed that I could do better than boys. When I grew older I think it became more pronounced in my attitude,” says Fowzia with a smile. Her interest was at two levels - technical and artistic. “My first love was fine arts and my dream was to become a pilot. Later when I entered the film field I felt it was the most natural thing to do as cinematography is a combination of both,” says Fowzia. She has a masters in fine arts from MS University, Baroda, and is a qualified pilot. He interest in cinema happened while she was in Baroda. “While in Baroda I started watching a lot of good movies at the Film Club and this inspired me to take up films more seriously,” she says. A native of Chennai, Fowzia recollects that it was difficult to convince her family while she tried to make a jump from fine arts to cinema. “First they thought I would take up medicine, then they thought I would stick to fine arts and then flying. But I could convinced them that I was serious about taking up cinematography as I got a first rank for my entrance examination at the Film and Television Institute of India (FTII), Pune, and received a scholarship,” she says. Since it’s a field which has scant representation by women, Fowzia says she had to try her best to convince the interview board that she was passionate about cinematography. “They said that women were not serious about this profession and most of them turned to direction. I told them that out of the 1000 men who joined the institute hardly 200 stuck to this field. Why didn’t they resent that? I was determined to prove them wrong. I didn’t want to let down women,” she says. Fowzia met director P C Shriram while she was doing her course at FTII and he immediately felt she should work with him. In 1996 she joined him as an apprentice. Her first big break was ‘Mitr My Friend’, which received many awards. It was followed by ‘Shadow of the Cobra’, a Hollywood movie. “It was a great learning experience. But unfortunately the movie is yet to be released.” Her other movies are ‘Evan’, ‘Whistle’, ‘Kuch Tho Hai’, ‘Uyir’, ‘Muthal, Muthal, Muthal Varai’ and ‘Chilanthi’. Fowzia, who is comfortable with Malayalam, has a Kerala connection. Her husband, Pradeep Cherian, is from Kottayam. “He is an artist. We met at Baroda.” Fowzia will be in Kochi for almost a month. So how is it to manage a family and career hand in hand? “My fiveyear- old daughter is in Chennai. I take up very few film assignments. It is mostly ad films that I am working on. So I don’t have to stay away from my family for long.” She has a few more film projects coming up her way in Tamil and Kannada. “It’s a dynamic career. There is a lot of magic in films,” says the talented woman who is lured by the magic of lighting.